MANAGEMENT, 12E includes several innovative pedagogical features to help students understand their management capabilities and learn what it's like to manage in an organization today. Each of the 19 chapters begins with an opening questionnaire that engages the reader's interest, directly connects to the topic of the chapter, and enables students to see how they respond to situations and challenges that real-life managers typically face. 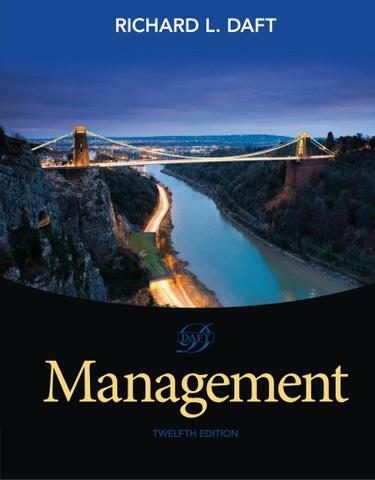 A New Manager Self-Test in each chapter provides students with further insight into how they would function in the real world of management. The Remember This bullet-point summaries at the end of each major chapter section give students a snapshot of the key points and concepts covered in that section. The end-of-chapter questions have been carefully revised to encourage critical thinking and application of chapter concepts, and Small Group Breakout exercises give students the opportunity to apply concepts while building teamwork skills. Ethical dilemmas, all-new end-of-chapter cases, and a fully updated set of On the Job video cases help students sharpen their diagnostic skills for management problem solving. The chapter sequence in MANAGEMENT is organized around the management functions of planning, organizing, leading, and controlling. These four functions effectively encompass management research and the characteristics of the manager's job.